Shadowhunters! 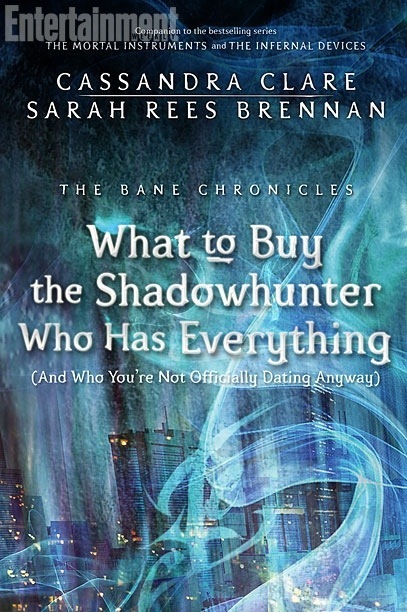 Entertainment Weekly has unveiled the cover for the eighth installment of The Bane Chronicles – What to Buy the Shadowhunter Who Has Everything (And Who You’re Not Officially Dating Anyway). The next installment will be released next Tuesday, November 19. Are you ready for the next installment of The Bane Chronicles? Guys, our fanfics are ruined. Alec is nineteen now. News flash, it says in between COA and COG. In COG Alec says that he is 18. So this is when he turns 18. I wonder if Magnus is the one who get him the new blue winter coat he has in CoG. You know the one he is wearing when he goes to tell Jace about Simon and Jace thinks he wants to tell him about shopping. We all know Magnus wants to expand Alec’s color veriety. Can someone tell me why the heck they changed the order? I mean I was looking so forward to their first date and now it only Comes out in January?? ?